A warm welcome awaits guests at Polbrean. All rooms are furnished in period style with comfort in mind. Our bedrooms have sea and garden views. Both have WiFi Internet connection. For that special occasion, champagne and flowers etc can be arranged for your arrival. 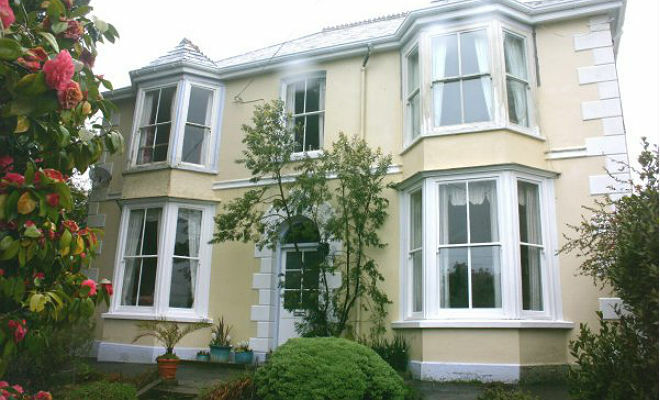 Polbrean offers 1 Double room with a large private bathroom and 1 Double Four-poster bedroom with en suite shower room. The Double en suite room has an additional folding bed available for a child/young adult. We also have pretty gardens and a conservatory for our guests' use. Polbrean is quietly situated and conveniently placed to reach all parts of Cornwall. THe mainline rail station is just 5 minutes walk away. The Branch line service from Par goes to Newquay on the north coast, the mainline down to Penzance, St Ives, Falmouth & Truro. We are also on the local bus route (First No.25/24). There are 2 Inns within close walking distance, serving excellent food or Fowey is a 5 minute drive away for a wider choice of eating places.